Over our many years of service to Southern California, we’ve responded to every kind of plumbing emergency possible, both for commercial and residential buildings. Below is a list of 6 of the most common plumbing problems people call us to fix in a hurry. If you run into one, don’t hesitate to call for a pro plumber in Corona, CA. Modern plumbing systems, whether in homes or commercial/industrial buildings, make extensive use of plastic pipes along with metal pipes (usually copper). 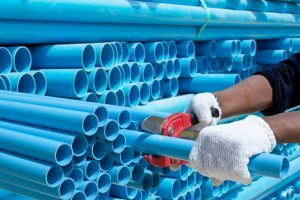 The most common of these pipes, PVC, which we’ll get into in greater depth below, was invented more than a hundred years ago and by the 1950s was established as a major part of the construction industry. It wasn’t until 1970 that PVC and other plastic pipes started to replace metal pipes in many plumbing systems. Now there is a variety of different kinds of plastic pipes in use in homes and commercial facilities. Below is a list of the types of plastic that our plumbers use for different repiping and new plumbing work throughout Southern California.